Our luxury vessels make for the most unique and exclusive venues for any Corporate Harbour Charters. Our corporate harbour charters are perfect for any corporate event you may have in mind. Corporate harbour charters are especially unique for international or interstate guests. We look forward to hosting your next corporate event. Our corporate charters are perfect for international or interstate guests that have not experienced Sydney Harbour by water. Our private corporate harbour charters will be sure to impress your colleagues or special clients, our vessels are fully crewed and have a fantastic range of catering and beverages options to choose from. SHLC accommodates for any type of corporate event you may have in mind. Each corporate event is tailored to the clients requirement to ensure we meet and exceed our clients expectations. 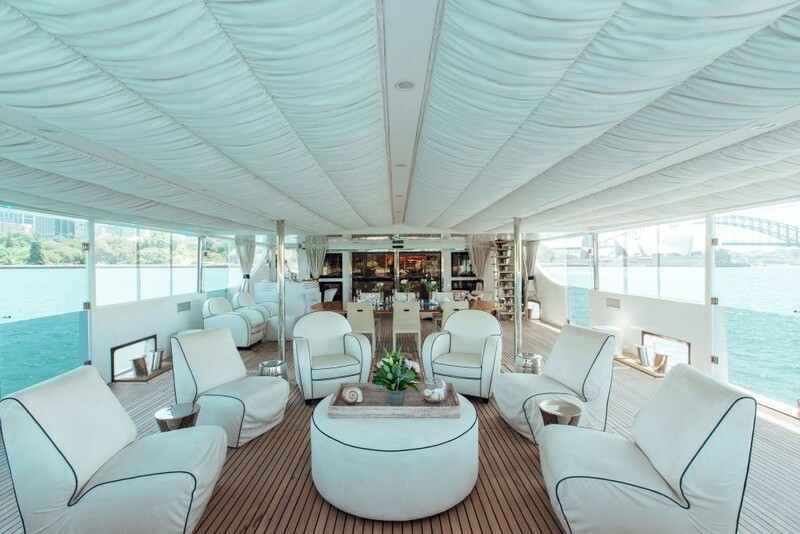 A corporate harbour charter is perfect for any industry type or size, with our vessels being able to accommodate for intimate events to much larger corporate charters ( 2 – 1000 guests). Our corporate harbour charters include meeting harbour charters, conference charters, christmas harbour charters or any kind of team building event you have in mind. Our vessels are equipped with built in state of the art AV facilities as well as fast and secure internet access to ensure your presentations go to plan. All of our charters are looked after on the day by your very own cruise director whom will ensure the event runs perfectly. Our vessels have many fantastic catering and beverage packages to choose from for your corporate harbour charter. In regards to catering, we can accommodate for formal dining for up to 350 guests and cocktail and buffet events for up to 1000 guests. Each vessel has their own on board caterer whom will prepare your meals on board. All of our menus can be tailored and we can accommodate for any dietary requirements you may have. SHLC only works with the most prestigious caterers. In regards to beverages, our vessels boats their own fanatic unlimited beverage packages for your planned corporate event. All beverage packages can be tailored if requested by the client. Some of our clients approach us with alcohol sponsors or catering parters and of course we are happy to work with any preferred suppliers you may have for your corporate harbour charters. We look forward to working with you on your next corporate harbour charter.